In the past week the stock market has made some incredibly huge moves. Almost everyone was caught off guard as many of us technical analyst’s expected this to happen in late September or October, not during the historically slow and low volume time of summer which we are in now. If you have been following me for any length of time then you know I have been warning about this first bout of selling which would kick start the next 8-18 month bear market in stocks. While we have been patiently sitting on our hands waiting for this break down to confirm, we’ve been rewarded in several ways because we followed our proven trading and investing strategies. If you have gone through the updates and video posted above then you know exactly what to expect looking forward 3, 6, 12 months out so I won’t go into detail again here. 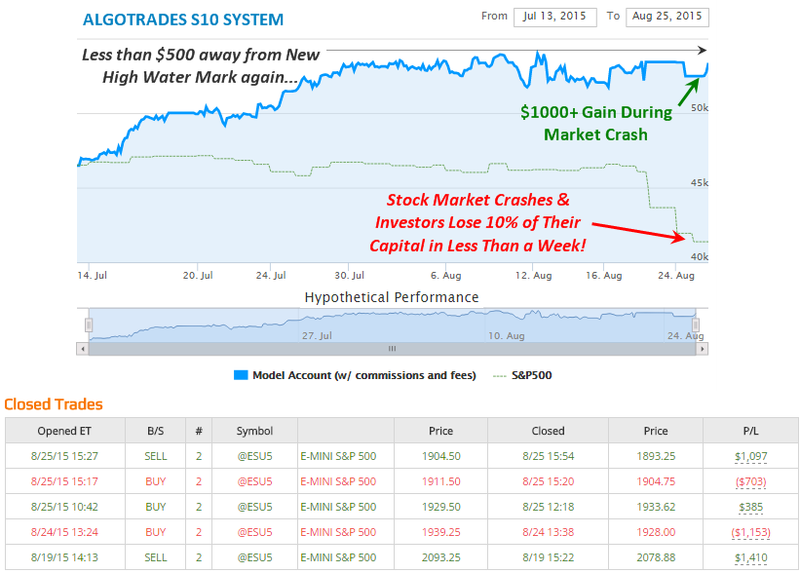 Since my initial The Sky Is Falling Post on Aug 20th the S&P 500 index had dropped 9.26% in value in only 4 days. The move was quick, violent and caught most traders by surprise. The exciting news is that my AlgoTrades automated trading system ended up generating just over $1000 gain which is a 6.6% portfolio gain in just 4 days based on a minimum capital required to trade our system. That is a whopping 15.86% spread from what an investor or trader would have experienced if they did nothing but listen and watch the market fall as the news updates the public. I should share some words of caution about trading with our systems. They do trade futures which means trades are highly leveraged. And if you look at the profits and losses above per trade you will notice on any given day we could give back $1400+ in gains/losses. In fact, we will have larger loses at times but my point here is that losses will happen as its part of trading. The recent volatility had been wild and not easy to trade to say the least, but the AlgoTrades System has handled the market exceptionally well in my opinion. The price swings we have experienced and the volume are not something we see every day, but rather once every year or so. Stay tuned because it benefits all new and current users! Emails are the best and quickest way for us to respond, but if you would like to speak with someone PLEASE leave a phone message and we will return your call. These new and improved systems go live for both new and current users on Sept 1st (ONLY FIVE DAYS LEFT). * No representation is being made nor implied that the use of the algorithmic trading system will generate income or guarantee a profit. There is a substantial risk of loss associated with futures trading and trading exchange traded funds. **Futures trading and trading exchange traded funds involve a substantial risk of loss and is not appropriate for everyone. ***These results are based on simulated or hypothetical performance results that have certain inherent limitations. Unlike the results shown in an actual performance record, these results do not represent actual trading. Also, because these trades have not actually been executed, these results may have under-or over-compensated for the impact, if any, of certain market factors, such as lack of liquidity. Simulated or hypothetical trading programs in general are also subject to the fact that they are designed with the benefit of hindsight. No representation is being made that any account will or is likely to achieve profits or losses similar to these being shown.